So, first we’ll start with the now. This screenshot is my main toon, Vaerron, in his current incarnation in fully transmogged glory. So now, let’s go back in time to when I was levelling him. This is the earliest screenshot I could find of him, level 46. 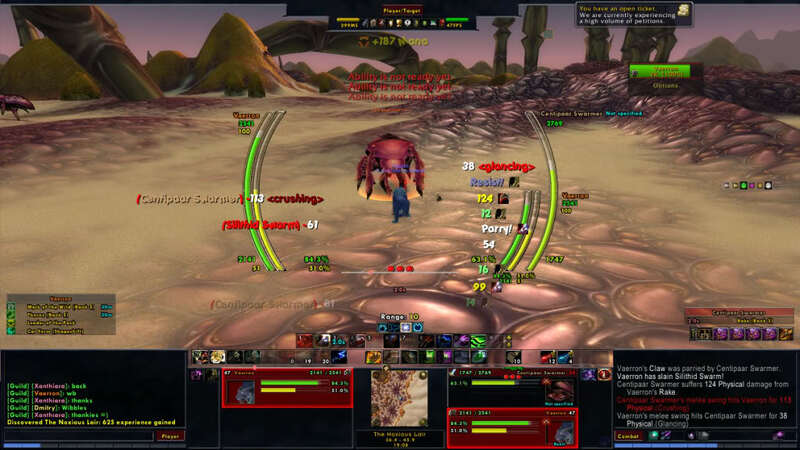 I actually took this screenshot as proof that something was borked and I was getting crushing blows done to me by mobs only 3 levels above me (as you can see in the chat). I was using nUI at the time, and it was nice for what it was, but having MSBT in that godawful font, AND cartographer’s quest helper going on the side, AND healbot, and oh my god there’s SO MUCH going on on my screen, hahaha. Oh man. This picture just amused the living hell out of me. I took it when Vaerron was levellng up (i think he was like 78 at this point?). I decided to go bird form and sit on the beak of the bird carved into the bow of the Skyshatter, flying over Icecrown. There may be a “Yo Dawg” joke somewhere in there, but i’m not cool enough to make it. Ahahahahahha. This shot also amuses me. My very first warlock (created shortly after I quit raiding in Ulduar)… His name was Vashon (and he was created BEFORE Vaerron… sense a theme? heh. It was unintentional, I swear). 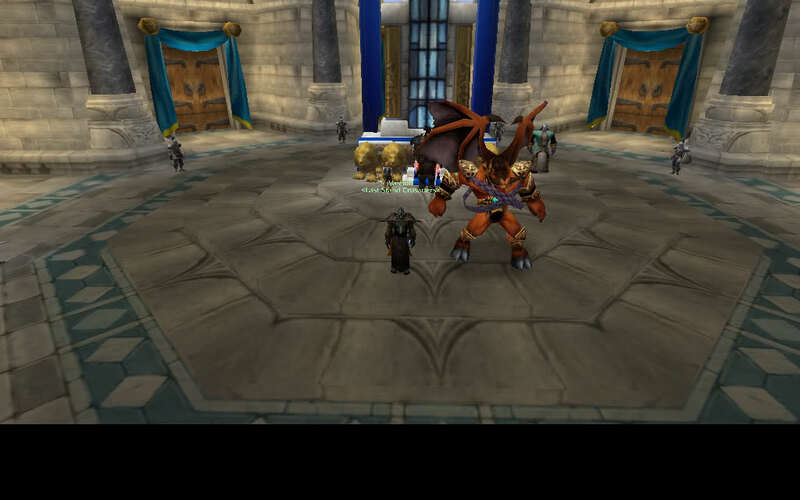 I don’t know why, but I felt the need to go and get my Doomguard and Infernal back before they were automatically given to you, and so I went through the old trials that it required… and then felt the need to let him loose in Stormwind. At this point in time, however, the Doomguard was *not* a hostile entity that you had to subjugate before he would DPS for you, so I just felt the need to stand in front of King Wrynn with him out. 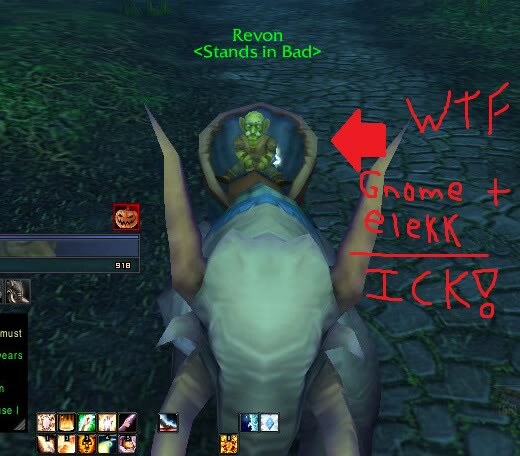 Oh, did I mention that this was on an RP server? It caused quite a ruckus ICly with the Stormwind Guard once they got wind of my shenanigans. 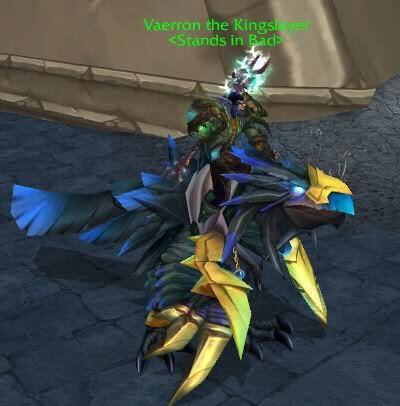 This is another picture of Vaeerron, taken while levelling. At first I thought I was in Silithus, but after realizing he was only level 47, I realized I was in Tanaris. This was another attempt to capture the “Crushing Blow” phenomenon that was happening to me. I later discovered that Crushing Blows were tied in with your defense skill more so than your actual level. If it was shortly after I levelled, then my defense rating hadn’t scaled up to the level I needed it to be at for the crushing blows to be knocked off the table. This picture… I don’t know exactly whey I took it, but it was one of my first times tanking a heroic, I think. Or maybe it was just to show off my UI, which I had recently changed. I actually like the way this was set up, other than the fact that the unit frames did HORRIBLE things with buffs/debuffs. Also, Tauntmaster is kindo f in a glaringly painful position at that time, but i’m pretty sure this was taken on my laptop, so screen real estate was kind of a commodity anyway. This one doesn’t have any real significance, but I laughed loudly when I stumbled on it again. This is one of the bazillion times I levelled a priest, and it was obviously during Hallow’s End… thus my leper gnome self. My “caption” really says it all, I think. Oh god. This screenshot was taken out of sheer outrage and amusement. 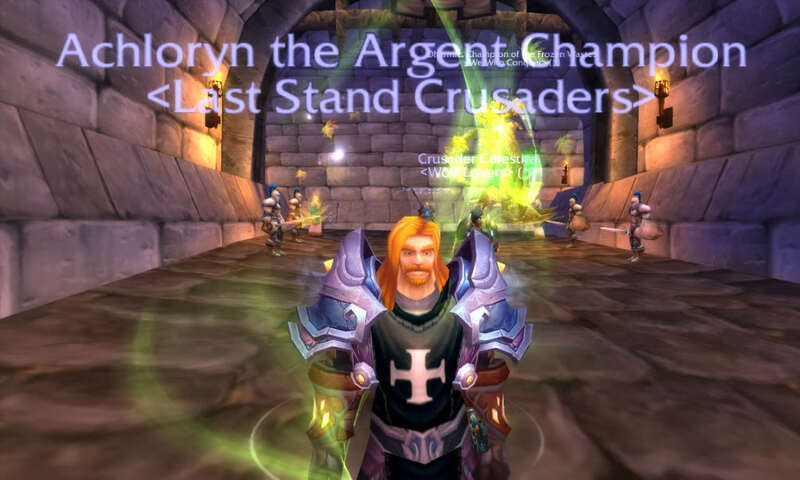 You see… Achloryn was my first REAL toon ever. It’s also one of the names I am most happy with, and thus why I have made it my main internet psuedonym. The thing is, Achloryn is a draenei. However, thanks to the magic of the Caverns of Time, I was transformed into a horrible, horrible looking human. I (not so) lovingly nicknamed this iteration of my mage as “Prince Valium”… and if you don’t get the reference, you clearly have not met your lifetime quota of Mel Brooks. I don’t play my mage anymore, and he’s pretty much retired. I levelled him to 85 out of a lack of anything better to do, but he probably won’t make it past 85… which is pretty alright with me. I’ve hopped mains a few times, from my mage, to my warlock, to a DK (not my current one), to a hunter (who got me back into raiding), to my current druid… and MoP may see another shift in mains. I’m kind of ADD, and tend to get distracted by shiny things that are given to other classes. I’m very much a “grass is always greener” kind of player. It amazes me that Vaerron (aka Fuzzbutt) has captivated my attention as long as he has. 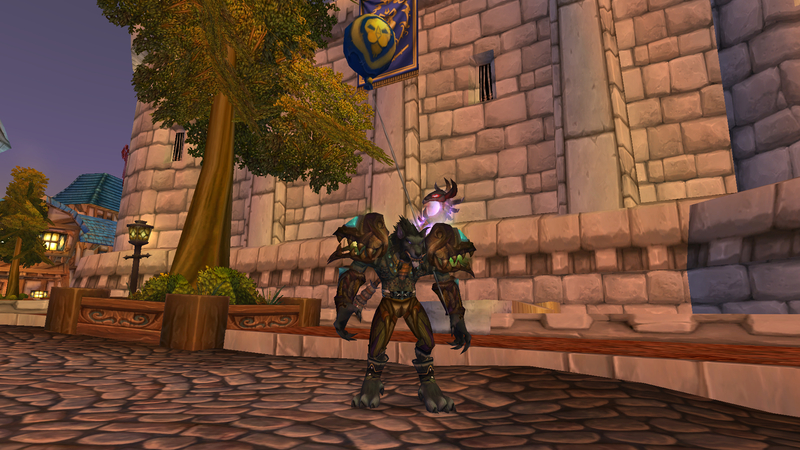 Oh wait, I briefly switched mains in Cata to my DK as well.. hah. So much for that theory.